This is a guest post written by Bert Eggen. A little history about the American War Cemetery in Margraten, a little village in the South of the Netherlands and our special bond with Mississippi. Bert by the grave of Earl Jenkins in 1947. Photo courtesy Bert Eggen. 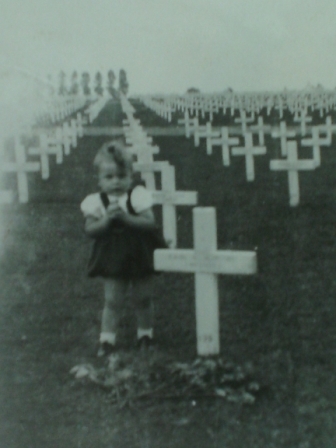 At the end of 1949 about 10.000 of the killed soldiers had been brought back to the USA and have been reburied there. This was also the case with Earl Jenkins. He has been reburied at the cemetery near Winona , Mississippi. Bert at Earl Jenkin’s grave in Mississippi. Photo courtesy Bert Eggen. At our first visit to the Jenkins family we also have visited his grave. Since that first visit, we go every year to Mississippi and visit them. From there we start our vacation-trip through the USA. At the present time there are still 8.301 American graves and the names of 1.722 missing soldiers are engraved on two big walls. On May 8th 2005 your President Bush and our Queen Beatrix visited the cemetery on the occasion of the 60th anniversary of the liberation of Europe. My wife and I have also adopted a grave. The name of our soldier is John Rutherford and he was also from Mississippi. About 12 years ago I started to do some research to find out about the families of those soldiers. Unfortunately our soldier John Rutherford doesn’t have any relatives. But it happened that we found the relatives of Earl Jenkins. We found his daughter Earline, his brother Clyde , his sister LuluMae and many of his nephews. Since that time, 10 years ago, we travel every year to Mississippi to visit our “new relatives.“ So it is obvious that we have a special bound with Mississippi. Every year on Memorial Day there is a special ceremony on the cemetery in Margraten. On each grave are two little flags planted, one American and one Dutch flag. Now we had the plan of also planting a little flag of Mississippi on the graves of the soldiers from Mississippi. It appears that there 98 of them buried in Margraten. 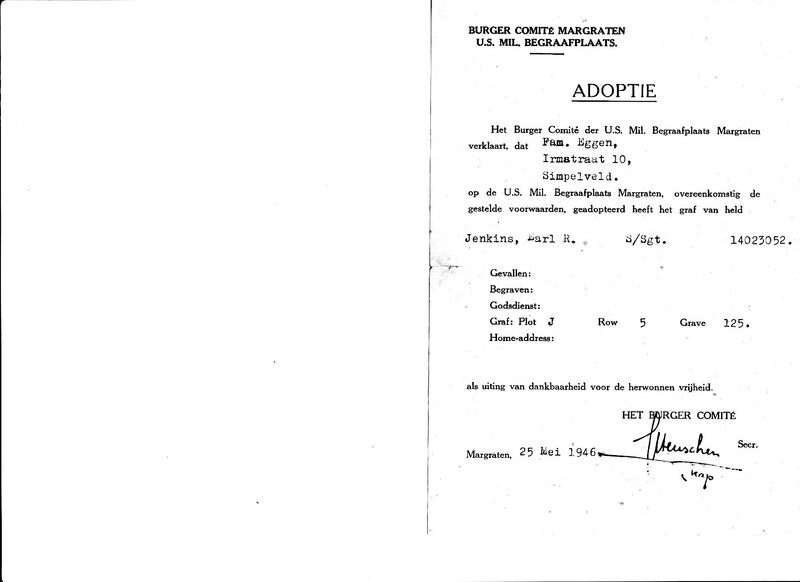 That is when I started to contact the Government in Jackson and informed them about the cemetery, the adoption by the Dutch citizens and my plan for the flags of Mississippi. Then things worked out very quick and very well, especially thanks to the great support of Mr. Chuck Holifield, Outreach coordinator of the Mississippi Veterans Affairs Board. In August 2013 my wife and I and some Jenkins were invited to the State Capitol in Jackson Mississippi. There was a ceremony and Governor Phil Bryant handed over 100 little Mississippian flags to me. It was a very special event for us!!!!! Every year with Memorial Day we place those little flags at the Mississippian gravesides. Do you have questions about John or Earl? You can email Bert Eggen to learn more. I am so very blessed to be a part of this story as a granddaughter of Earl Jenkins. Bert and Thea Eggen have become true family to our family as they embraced our loved one years ago as a fallen soldier and today as the family of who gave his life for theirs. Our USA family treasures the Eggens and their quest to find the family of “their soldier”. They have visited in our homes, and we in theirs. We have have a bond that is as strong as blood!!! Rhonda thank you for posting and sharing your story about Earl and the Eggen family.